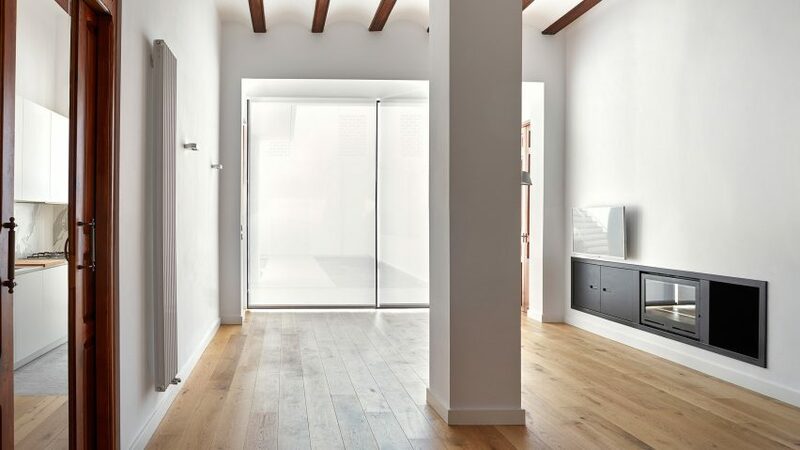 The original wooden doors and vaulted ceilings of this Valencian townhouse have been retained in renovation works carried out to improve its connection with a landscaped courtyard. 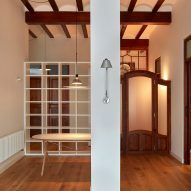 The house dating from the early 20th century was refurbished by local studio DG Arquitecto Valencia, which reconfigured the internal and external spaces to better suit the needs of a young family. 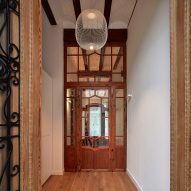 Located in the Spanish city's Horta Nord suburb, the building features a brick street-facing elevation incorporating decorative details including arched window heads and raised relief patterns. 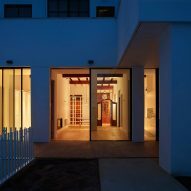 The facade was preserved and renovated, with the only noticeable alteration taking the form of a large steel-framed window fronting a bedroom on the ground floor. 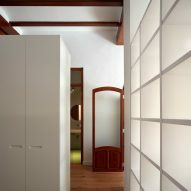 Internally, the cluttered arrangement of compact rooms was simplified to create more generous spaces with longer sight lines providing an improved sense of continuity. 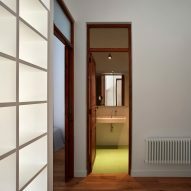 The more open floorplan also offers views from the front of the house through to a rear courtyard containing a new swimming pool. 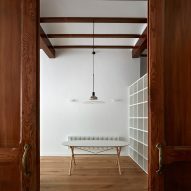 "The new layout of the house comes out as a result of […] preserving the essence of the original house and opening the main spaces to the backyard," said the architects. 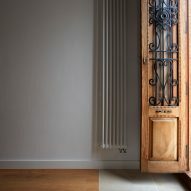 Original features including the barrel-vaulted ceilings, wooden beams and panelled doors were carefully integrated into the updated scheme to maintain the property's original character. 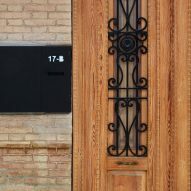 From the street, a vestibule with built-in cabinets is connected to the main living areas by a grand door inset with glass panels. 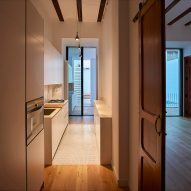 A frosted glass door set in a wooden screen provides privacy to the lounge and dining space, which adjoins a laundry and galley kitchen. 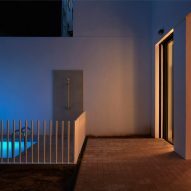 Both the kitchen and living room are flanked with tall glazed doors that open onto the pool deck and an outdoor barbecue area. 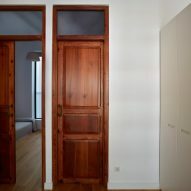 Open shelves separate the living space from a hallway providing access to the two bedrooms facing the street and a master suite with a walk-in dressing area that also looks out onto the rear courtyard. Photography is by Mariela Apollonio.